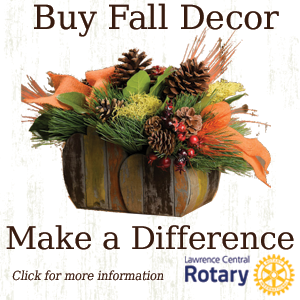 Fall Decorations for your home and help Lawrence Central! October 14, 2018 / admin / Comments Off on Fall Decorations for your home and help Lawrence Central! Lawrence Central Rotary recently launched or 2018 fall and holiday decoration campaign. The money raised helps to do the service work of our club both locally and globally. Fall decorations are available now and you can even pre-order your holiday wreaths and evergreen centerpieces or garland! Thank you for helping us to continue to do the work we do!